Aneya Fernando is the Social Media Editor for Charity Miles. At Charity Miles, we have the most compassionate community of athletes, activists and everyone in between. We love sharing their stories with The Huffington Post community. Today we're featuring Adam Hill, who recently went through a dramatic transformation. Two years ago I was unhealthy, depressed, stressed and abusing alcohol. After making some significant lifestyle changes to improve my spiritual and mental wellbeing, I made a decision to improve my diet and physical health as well. I am currently training for Ironman distance triathlons. Additionally, I am actively fundraising for a variety of charities through my website. What is your greatest accomplishment as of late? 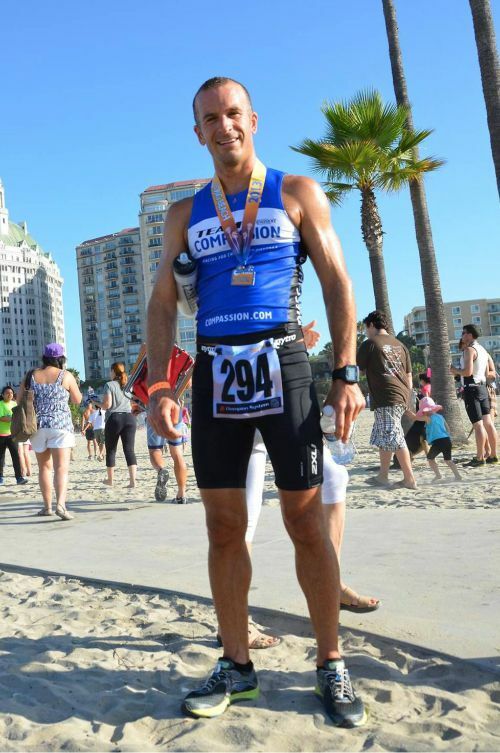 I recently placed fifth out of 46 in my age group (30-34) in the Long Beach Triathlon, the second triathlon I have finished. My goal was to finish in one hour 15 minutes, and I beat that goal by five minutes. This success came a month after a bad bike crash in a previous race which left me shaken and injured. I am proud of this accomplishment because I was able to show myself what I'm capable of. A lot of my success thus far has been associated with overcoming my own fears and insecurities. When I first began training, I was out of shape, had an unhealthy diet and couldn't run down the block without becoming out of breath. I couldn't swim more than a few laps in the pool and had never even been on a road bike. At that point I couldn't fathom doing a sprint triathlon, let alone a full Ironman! However, I simply didn't dwell on the larger goal, but instead segmented it into smaller, more easily achievable goals. Also, I held myself accountable to my goals by writing about my experience publicly, and finding ways to be in service to others while helping myself get healthy. This truly motivates me to meet any challenges head on, and continue on the path to achieving my goals. What motivates you to make the world a better place? I truly believe that people are most joyous and fulfilled when they are giving freely of themselves. I try to be a testament to that, as I came from a place where I once felt hopeless, but have found peace and joy in giving and service. I hope through my experience, to inspire others who may have a similar feeling of hopelessness, that they may come to believe that there is hope, joy and peace. This is what motivates me to continue doing what I'm doing. There is no "magic pill" for me, but the work I put in on diet and exercise is very fulfilling and energizing. Simply, I now eat as clean as I can, with little to no processed foods or refined sugar. As far as fitness is concerned, what once began as a 20-minute walk on a daily basis has developed into a 20-hour a week training regimen. Practice humility, patience and acceptance in everything. I've found this can be applied to most areas of life and has helped me a ton in many situations by allowing me to keep my ego in check and accept the things that are out of my control. What's your favorite aspect of using Charity Miles? I consider Charity Miles a partner in my training. It allows every workout to be meaningful. Even on days where I feel it was a wasted effort, or I wasn't at the top of my game, I can look at the application and see how my effort benefited others, even if in a small way. In that way, I can be motivated to get back out there and train another day. Who do you exercise for, and why? I exercise to inspire others to find the greatest person within themselves. I hope that through my efforts others can come to believe that everyone can find something meaningful and fulfilling in their lives. I exercise for my kids because, at age two and five, they are watching everything I do, and I am an example in their lives. I also exercise for myself. I know where I have come from, and I don't want to become that person again. Being spiritually, mentally and physically healthy has been an effective way to provide me a joyous and peaceful life. To hear more stories from the Charity Miles community read our Spotlight On series. Aneya Fernando is the Social Media Editor for Charity Miles. She is also a writer and producer.